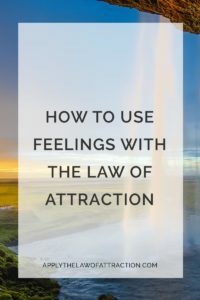 Feeling good is the most important thing when it comes to using the Law of Attraction because how you feel about something is a sign of what you are creating. When you are feeling good, you are in vibrational alignment with the essence of who you really are and with what you want. The more emotion you feel, the greater the vibrational alignment. That is why feeling good needs to be a top priority in your life. It isn't something that you put off until you accomplish your “to-do” list. It is something that needs to be experienced at all times. If you stop at any time during the day and focus on your emotions, you will discover the energy you are sending out to the world at that very moment. The more often that you feel good, the more you are not only saying “yes” to your life today, but you are also more of a match to the experiences that you want to manifest. So, whenever you are focusing on a particular desire that you want to manifest, ask yourself how you feel about it. The better your feelings, the closer you are to getting what you want. To raise your level, simply think of the things you are grateful for. Include the big things and the little things. And watch your feelings get better – become more joyous, happy, and loving. You can even start a gratitude journal where every day you write down at least three things that you are grateful for that happened that day. It can be anything from a gorgeous sunset to winning the lotto. Just concentrate on feeling good…and the Law of Attraction will take care of the rest. If you want more information on gratitude, feeling good, or how to make the Law of Attraction work, check out the pages below.